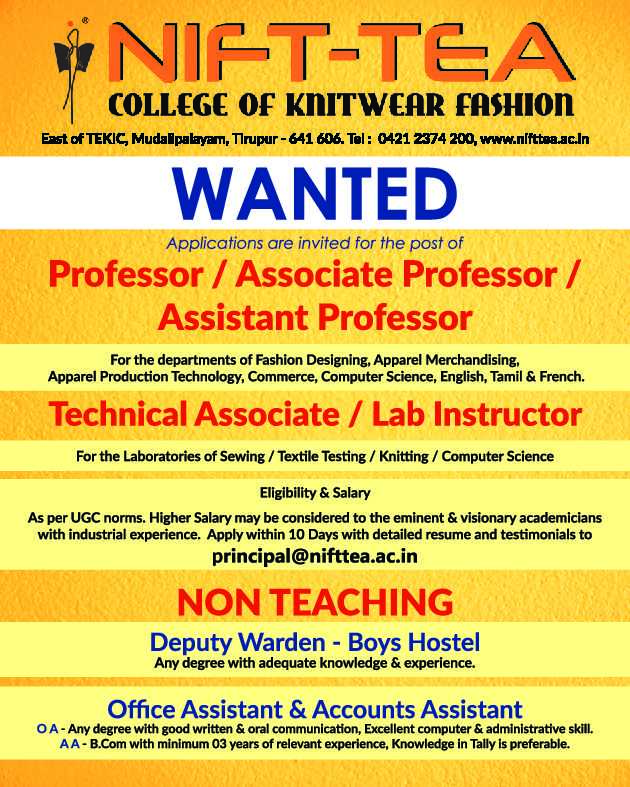 NIFT-TEA College of Knitwear Fashion, Tirupur has advertised in THE HINDU newspaper for recruitment of Professor / Associate Professor / Assistant Professor Plus Non-Faculty jobs vacancies. Interested and eligible job aspirants are requested to apply within 10 days from 10th April 2019. Check out further more details below. About College: NIFT-TEA was born out of the educational vision of Tirupur Exporters to create innovative initiative to extend all-encompassing education & intensive training in the niche arena of Knitwear. Established in 1997 with the support from the Ministry of SSI & ARI, Government of India and ICICI, NIFT-TEA continues to be the first and only one of its kinds not just in India, but across the world as well.